French violinist CHLOE KIFFER, a 2014 Heifetz alumna and 2015 Artist in Residence, was born to a family of musicians and started playing the violin at the age of six. She has been a top prizewinner in a competitions and festivals all around Europe, Chloé won the prestigious prix de la vocation from the Bleustein-Blanchet Foundation in 2012. After coming to the United States to continue her studies, she won the 2013 Eisenberg-Fried String Concerto Competition at the Manhattan School of Music, where she performed Stravinskys Violin Concerto in D at the schols opening concert under conductor George Manahan.? ?Chloé has performed as a chamber musician and orchestral soloist in concerts and at festivals all around Europe, as well as Israel, China, Canada, and the United States. She entered the Conservatoire National Supérieur de Musique in Paris at the age of 15 and graduated with a Bachelors Degree in Violin Performance. She went on to earn an Artist Diploma from the Saarland Höchschule für Musik in Germany, and after studies with Pinchas Zukerman and Heifetz Institute faculty violinst Patinka Kopec at the Manhattan School of Music, is now a student of Philip Setzer, Professor of Violin at Stony Brook University, and violinist of the Emerson String Quartet. 2015 Heifetz Institute alumna ERICA GAILING began her studies on the violin, at the age of five, at the Center for Preparatory Studies in Music at the Aaron Copland School of Music at Queens College in New York. At 13, she continued her studies at the Manhattan School of Music Pre-College under Maria Radicheva. Having received a Macaulay Honors Scholarship, Erica attended the Aaron Copland School of Music at Queens College studying under Professor Daniel Phillips of the renowned Orion Quartet, where she completed a Bachelor of Music degree in Violin Performance. While at Queens College, Erica studied abroad in Perugia, Italy at the Conservitorio di Umbria, where she performed in both classical and jazz settings. Erica has furthered her studies in many places around the world, having attended the Boston University Tanglewood Institute in Boston, Domaine Forget in Canada, the International Music Festival in Pilsen, Czech Republic. Just two summers ago, Erica she began playing the viola and loved it so much she decided to make it her career. Erica currently attends The Juilliard School, where she is pursuing a Masters degree in Viola Performance under Toby Appel. Born into a musical family in Beijing, cellist MO MO began his studies at age of six and was later accepted to the middle school of Central Conservatory of Music in Beijing, where he studied under Professor Tao Song. In 2008, Mo Mo was accepted to Yale School of Music under full scholarship at age of 18 and began his four years study with renowned Brazilian cellist Aldo Parisot as one of his youngest pupils. During his study at Yale, Mo Mo was awarded the Aldo Parisot Prize for his achievements in cello. playing. Mr. Mo had appeared in many concert stages across America and also in China, and at the Heifetz Institute in 2015 he collaborated with such world-famous musicians such as Shmuel Ashkenasi, Mark Kaplan, Robert Vernon and Ilya Kaler. In 2013, Mo Mo received the Karl Zeise Memorial Cello Award at the Tanglewood Music Center. Mo Mo is currently studying at the New England Conservatory of Music under Professor Laurence Lesser. HSIN-CHIAO LIAO has just completed her first summer as a Chamber Music Piano Fellow at the Heifetz Institute. Born in Taiwan, Hsin-Chiao received national recognition even during her younger years. Her early achievements include First Prize at the Kawai International Piano Competition, TCSSH Concerto Competition, HTK Music Competition for Talented Youth, and Second Prize at the Piano Competition of Taichung City, Taiwan. She was also selected as soloist for the New Sound of Guandu at the age of nineteen. 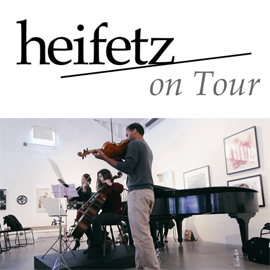 In 2011, she moved to the United States to pursue her dream as a professional pianist and since has appeared as a recitalist, chamber musician, and collaborative artist in many celebrated venues and festivals across the US and Asia., including Symphony Space and Weill Recital Hall at Carnegie Hall in New York, Music@Menlo in California, and the Heifetz International Music Institute. Ms. Liao studied under Mei-Ling Wang at Taipei National University of the Arts where she received her Bachelors of Music degree. She completed her Masters of Music at Stony Brook University and is currently pursuing her Doctor of Musical Arts degree at Stony Brook University under the tutelage of Gilbert Kalish.